Liverpool beat Norwich City 5-0 at Anfield while posting some impressive passing statistics. I’ve previously used network analysis to assess Liverpool’s passing this season. It has been a while since I last posted something on this but now seemed a good time to get back to it. Below is the passing network for both Liverpool and Norwich City. The positions of the players are loosely based on the formations played by the two teams, although some creative license is employed for clarity e.g. Suárez’s position is shifted left-of-centre. It is important to note that these are fixed positions, which will not always be representative of where a player passed/received the ball. Only the starting eleven are shown in this instance. 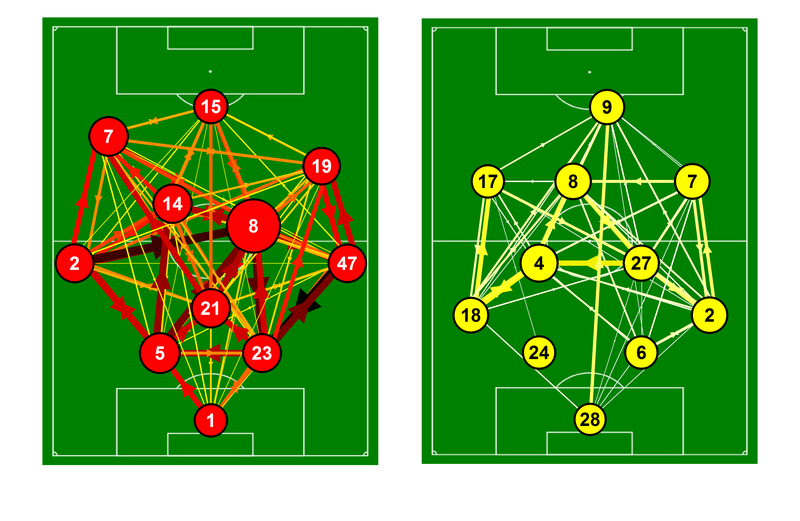 Passing network for Liverpool and Norwich City from the match at Anfield on the 19th January 2013. Only completed passes are shown. Darker and thicker arrows indicate more passes between each player. The player markers are sized according to their passing influence, the larger the marker, the greater their influence. Only the starting eleven is shown. There is a stark contrast between how the two teams approached passing the ball. Looking at Jones, the back four and Lucas, there are a multitude of connections between them as Liverpool aim to build from the back. Furthermore, Henderson and Gerrard are heavily involved in this area as the team aims to recycle possession – look at the strong links between them, Lucas and the centre-backs. This is completely missing in Norwich’s network as they sought to be more direct – see the long link between Bunn and Holt for example. Norwich created relatively little during the game and it is clear from their passing network that Holt was fairly uninvolved. I’ll not delve into Norwich’s passing network any further. An important diagnostic for network analysis is a measure known as “closeness centrality”, which in this context is dictated by the number of passes played and received by a given player. The higher the value the better and this can be thought of as the “passing influence” that a player has on their team. The absolute values aren’t important in this instance* so the main thing to look at is the relative size of the circles for each team. One of the major aspects of Liverpool’s network is that all of the outfield players aside from Sturridge were heavily involved in the passing movements of the team. Sturridge’s lesser involvement isn’t a criticism as such, as he clearly combined well with Liverpool’s more advanced players. In some ways, strikers can be disadvantaged by such a measure as they have less opportunity to get involved with everyone in the team, which can also be the case for goalkeepers. A more even distribution of passing responsibilities allows a side to create multiple attacking angles/opportunities – notice the large level of criss-crossing of the networks for Liverpool’s attacking players. Liverpool’s front-five plus Glen Johnson had a large amount of interplay with able support from Wisdom and Lucas. However, there was clearly a stand-out performer in terms of passing influence as Steven Gerrard dominates the passing network for Liverpool. Gerrard was the hub of the team’s passing. This combined with the rest of the team stepping up to the (passing?) plate, meant that Liverpool delivered an excellent passing performance. Whether they can continue this level of performance over the coming games will be crucial. *At some point I want to put these measures into a more quantitative context, which will hopefully add further detail regarding how Liverpool’s passing develops. This entry was posted in English Premier League, Liverpool, Network Analysis, Passing and tagged EPL, Liverpool, Norwich City, Passing by Will Gurpinar-Morgan. Bookmark the permalink. Interesting use of network analysis, where do you get the passing stats identifying recipient of each pass as well? Did you use Gephi to put it together? Thanks. You can get the data from StatsZone. I didn’t use Gephi. I actually put them together by writing some code for the analysis package I usually use (Igor Pro – a bit like MatLab).